The KOBE 360 dirt scooter is our highest rated 2-wheel scooter for ages 8 to Adult. - it offers top of quality and style for a great price. - specially designed to tackle dirt, rough trails and tough road conditions, proves that off-road scooter riding is just as much fun. - frame made from reinforced steel with 360-degree swing rotation deck. 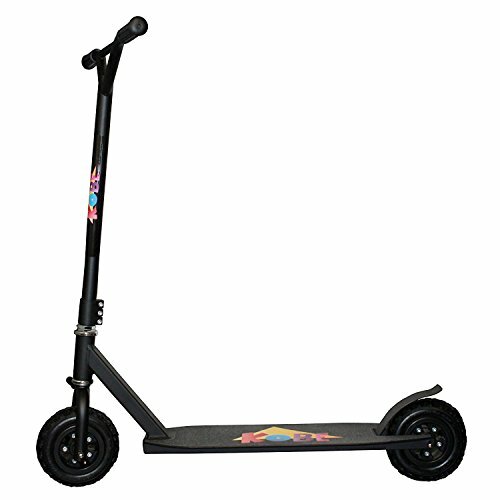 - the dirt scooter is strong and lightweight, which makes it easy to carry around, weighting only 10.8 lbs (4.9 kg), with a maximum rider load of 220 lbs (100 kg). - features: 170 mm PP core pneumatic 50 PSI wheels & Abec carbon bearings for a smooth and easy to operate turns. - rear wheel is covered with reinforced steel back brake for easy, quick stops. - the soft rubberized grips allow for full control of the handles. - pneumatic 200mm knobby tires with aggressive tread pattern made for maximum shock absorption. - large 6.5 inch (16.5 cm) wheels. - curved & reinforced BMX 590 mm steel T- bar handlebar. - triple stacked collar clamp. - size: L35 x H37.5 x W21 inches (89x95x53 cm). - 550 mm powder coated aluminum full grip deck circumvents slipping. - deck dimensions: L23.5 x H10 x W6.5 inches (58.5x25. 5x14 cm).